It's that time of year again! The 2018 OC Classic will be held August 25th @ Spear America Irvine. Club member's entry is only $25 & that includes a sick shirt, food & beer! $1000 First place $500 Second & $250 for third. Don't forget about the awesome raffle & free beer! 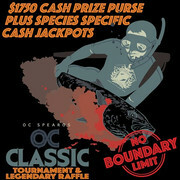 Pre-registration for the OC Classic Spearfishing Tournament includes a T-Shirt, lunch, the opportunity to win great raffle prizes, and awards for the top five competitors. This is a family event for all to enjoy. Additional Tournament T-Shirts are available for purchase in limited numbers while they last. Time: From First Light to 5:00 pm. All fish entries must be presented for judging by the 5:00 pm deadline. All late entries will be disqualified. The Tournament is a three fish contest and will follow the National Spearfishing rules, but will be in a scramble format. The top five participants with the highest numbers of points scored (see scoring method below) will receive prizes. Only the top three will split the cash purse in a ratio of 4:2:1. All State and Local game/fish rules apply. Competitors must possess a valid CA fishing license. All spearguns, including pole spears, must be loaded using muscle power. Spearguns must be loaded and unloaded in the water. No free-shafts will be allowed. No chum or baiting allowed at any time. Fish may only be taken while freediving. Use of SCUBA or hooka system will not be permitted. Divers must take their own fish with any aid whatsoever upon penalty of disqualification. This will be a NO BOUNDARY LIMITS Tournament this year. Hunt wherever you want and bring your catch to the weigh in by the deadline. All fish must be taken the day of the event. Divers may not enter the water until first light August 25, 2017 and must be presented for judging at Spear America by the 5:00 pm deadline. All late entries will be disqualified. Each 2018 OC Classic entrant that has secured a paid position to compete in the 2018 OC Classic Spearfishing Tournament will be given the opportunity to add on as few or as many of the fish specific jackpots as they desire. A jackpot will become active when more than one (1) participant has opted in to that species’ jackpot. Should only one participant elect to join a species category, the participant will be given the opportunity to have a full refund for that species, or to roll the jackpot fee into the total grand prize purse less a 10% OCS administration fee. Should a category be active (ie more than one entrant) and zero fish are submitted within that species, the full species jackpot funds will be rolled into the overall grand prize purse to be distributed to the winners as outlined in the general guidelines. Biggest fish within a given species wins the entire jackpot for said species. Jackpot participation is voluntary and not a required part of the Tournament. The OC Spearos will retain 10% of all monies paid toward registration and jackpot for purposes of management, administration, and Tournament site expenses. All participants are expected to conduct themselves in a respectable manner both in the water and at the weigh in. Any bad sportsmanship or unruly behavior towards another diver or person at the event will results in disqualification and removal from the Tournament.